The firm is well known for its finance practice. We structure, negotiate and document a wide range of financing transactions for banks, asset-based lenders, finance companies, insurance companies and hedge funds. Our expertise includes secured and unsecured financings and second lien, subordinated, single lender and syndicated loans, as well as other financing arrangements such as trade finance, receivables purchases and structured finance. We assist clients in domestic financings throughout the United States, as well as cross-border transactions for varied purposes including working capital, acquisitions and other transactions for businesses of all sizes across a wide range of industries. We work closely with our lending clients to develop relationships that enable us to better understand their approach. We know how issues are handled across different types of debt products and markets, and apply our understanding to tailor solutions that meet the challenges of each transaction. Our objectives are to help our clients understand the legal issues affecting each financing, and work with the other parties in the transaction to facilitate the prompt resolution of issues in the most efficient and effective way. While we understand that lenders want to limit and manage their risk, we also know that they need to develop a positive working relationship with borrowers. We approach the loan process with these goals in mind. The firm’s expertise in workouts and bankruptcies gives us the ability to provide real-world advice concerning the ways in which issues would be addressed in such circumstances. We work to develop deal structures that achieve our clients’ goals while minimizing legal risks should the borrower become involved in a workout or bankruptcy. Our finance practice encompasses a broad range of transactions. We advise banks and other institutional lenders in acquisition financings and recapitalizations, representing agents or members of lending syndicates, and including senior secured debt facilities, leverage loans, second lien loans, mezzanine and other subordinated debt and debt products. Whether an acquisition is structured as an asset purchase, a stock purchase, a merger or a tender offer, we help lenders navigate the legal issues that arise in the context of funding the acquisition and create a structure that will best meet its requirements. We have represented lenders in the financing of acquisitions by leading private equity groups and other sponsors. Whether as a stand-alone facility or as part of a multi-tiered capital structure of a borrower, we have a unique depth of understanding of the issues faced by asset-based lenders. Our experience enables us to provide clients with a wide range of alternatives for the structuring and documentation of an asset-based facility. We have worked on financings with borrowers in a broad spectrum of businesses, and understand the issues that arise for the lender in creating and perfecting security interests in different types of collateral, as well as matters that may affect the priority of the lender’s liens. As a result of our role as co-general counsel to the Commercial Finance Association, the national trade association for lenders engaged in asset-based lending, we are in the forefront of addressing issues that affect not only the industry as a whole, but our clients in particular. We represent banks and finance companies in the structuring of receivables purchase facilities with or without the use of special purpose vehicles, as well as loan facilities for use in structured finance transactions. Our lawyers work with sponsors and conduits in the documentation and review of securitizations involving trade receivables, commercial loans, home equity lines, mortgages and other assets, as well as workouts and litigation arising from such arrangements. As part of the structuring of such arrangements, we understand the intercreditor issues that arise when the originator has inventory lenders or other secured debt. We represent banks, as well as insurance companies and other private purchasers of debt instruments, in secured and unsecured general corporate and working capital facilities of varying size and complexity. Our lawyers have broad experience in multiple borrower financings, syndicated credit facilities, and international and cross-border transactions, as well as intercreditor issues arising in these financings. Our lawyers have worked on transactions in a diverse array of industries, including healthcare, government contractors, telecommunications, manufacturers of steel, automotive parts, chemicals and consumer products, nationally-known branded apparel manufacturers and distributors, record, book and video distributors, retail and wholesale grocery distributors, national, regional and local retailers, agricultural suppliers, airlines, logistics companies and others. We also represent lenders in loans to high net worth individuals and their businesses. Debtor-in-Possession (DIP) Financings. We handle the preparation and negotiation of the financing order and financing documents, as well as court appearances for the approval of the financing for companies that have begun proceedings under Chapter 11 of the U.S. Bankruptcy Code. Our firm is known for its ability to manage the process of obtaining approval of the financing on the best available terms for the lender. Exit Financings. When a lender is providing financing to a company as part of its plan of reorganization, we have the expertise required to deal with the bankruptcy process and documentation. 363 Purchases. We assist lenders who finance the purchase of assets being sold by a Chapter 11 debtor-in-possession pursuant to Section 363 of the U.S. Bankruptcy Code. As with all aspects of a lender’s involvement in the Chapter 11 process, the terms of the order approving the sale can be critical. We know what the lender needs in order to be protected. Our finance lawyers are involved in trade finance transactions, using techniques ranging from factoring and invoice discounting to commercial and standby letters of credit, bankers’ acceptances, purchase order financing and receivables purchases. We understand the intricacies and risks for lenders in the financing of goods-in-transit, and are expert at import financing. As a result of our work in financings of companies with subsidiaries or assets outside the United States, we have developed an expertise in cross-border legal issues, including secured transactions laws and insolvency laws that affect how a multi-jurisdictional financing is structured. We work closely with a network of law firms throughout the world to address issues that U.S.-based lenders confront in multi-jurisdictional financings. As a result, we are able to choose the best counsel for each transaction without being limited by formal affiliations. Our involvement in projects on international finance with the United Nations Commission on International Trade Law (UNCITRAL) has given us a unique understanding of the issues that a lender will confront as it moves beyond the United States. We also regularly represent lenders located outside of the United States in matters involving U.S. companies or assets located in this country. We represent arrangers, agents, and lenders in syndicated loan facilities whether domestic or international, secured or unsecured. We know the issues that a lender will confront, not only in dealing with its borrower, but also with other agents and lenders in the facility. Our experience in such facilities enables us to devise a practical balance of rights and responsibilities among the agents and lenders that will satisfy the needs of our clients and allow transactions to close smoothly. 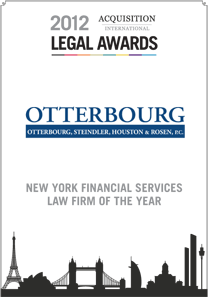 2014 Global Law Experts Awards Selects Otterbourg P.C. Is There Anything New in Asset Based Lending? Issues for Commitment Letters in Acquisition Financing: Be Careful What You Wish For! Otterbourg Attorney Participates in Panel on "The Trump Effect"